In case you need a little “ahhhhhhhhhhhh” heart melt moment, have a look at this story. It is simply wonderful. I just love to find these and discover over and over again how wonderful our world really is and how love transcends everything – death, time, space, species, races – there are no limits for this amazing energy to exist! Enjoy and please share if you’d like! “An amazing occurrence happened in South Africa when 31 elephants made a “Journey To Pay their Respect.” How did they know? Something that is greater and deeper than human intelligence informed them that their hero – the man who had saved their lives and many other animals – had made his transition from this earthly world. Lawrence Anthony (1950 – 2012), a legend in South Africa and author of 3 books including the bestseller “The Elephant Whisperer”, bravely rescued wildlife and rehabilitated elephants all over the globe from human atrocities, including the courageous rescue of Baghdad Zoo animals during the US invasion in 2003. On March 7, 2012 Lawrence Anthony died. Two days after his passing, the wild elephants showed up at his home led by two large matriarchs. Separate wild herds arrived in droves to say goodbye to their beloved man-friend’. A total of 31 elephants had patiently walked over 12 miles to reach his South African House. Witnessing this spectacle, humans were obviously in awe not only because of the supreme intelligence and precise timing that these elephants sensed about Lawrence’s passing, but also because of the profound memory and emotion the beloved animals evoked in such an organized way. Walking slowly – for days – they made their way in a solemn one-by-one queue from their habitat in the wild bush to his house. Lawrence’s wife, Francoise, was especially touched, knowing that the elephants had not been to his house prior to that day for well over 3 years! But yet they knew where they were going and they seemed to know why they were going to Lawrence’s home. The elephants obviously wanted to pay their deep respects, honoring their human friend who had saved their lives – so much respect that they stayed for 2 days 2 nights without eating anything. 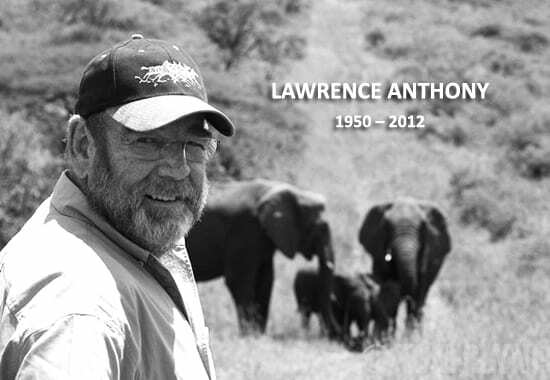 After honoring Lawrence Anthony in the only way they could – in this touching and memorable tribute to the man who had saved them and many other animals around the world – these sentient creatures had proven they are wiser and more compassionate than the human race will ever be or ever realize. Then one morning, they left, making their long journey back home. . . .